The Amazon Freedom Sale has already started and will last till August 12. In this list below, We have put together some of the best deals that we have found on the Amazon. Last month, the Amazon hosted its Prime Day sale which was exclusively open to Prime members. However, the Freedom sale is open to all and brought over 20,000 deals on a variety of gadgets. In this list, we have covered the products that are from brands like Samsung, Huawei, Amazon and more. The Huawei P20 Lite sports a 5.84-inch full HD+ display with a resolution of 2280 x 1080 pixels. The smartphone features a 24MP selfie camera with 3D retouching feature which adjusts lighting and shadow automatically using artificial intelligence. At the back, it has a dual 16MP + 2MP sensor, which offers features like the Bokeh effect. When it comes to the performance, the smartphone is powered by an octa-core Kirin 659 processor. Click here to buy. 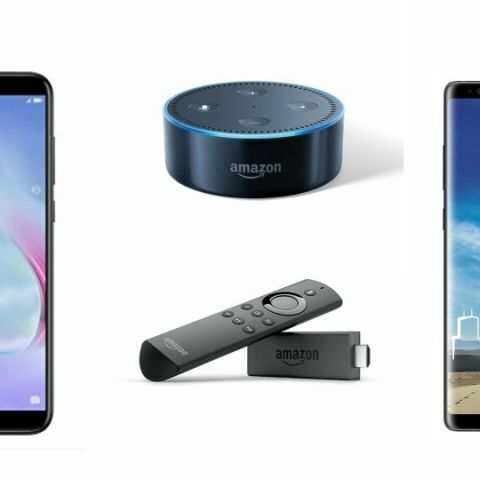 Amazon Freedom Sale Day 4: Discounts on smartphones, TVs, and more. The Samsung Galaxy Note 8 sports a 6.23-inch QHD+ display with a resolution of 1440 x 2960 pixels. The smartphone is powered by an Exynos 8895 octa-core processor. This premium device features a dual camera setup at the back, it has a 12MP dual rear sensor and an 8MP unit at the front. Click here to buy. The Honor 7x is powered by Huawei's own Kirin 659 octa-core processor, which is paired with 4GB RAM and 32GB internal memory. The smartphone sports a 5.93-inch full HD+ display with a resolution of 1920 x 2160 pixels. As far as the cameras are concerned, it has a dual 16MP + 2MP camera setup at the back. For the selfie lovers, the device is equipped with an 8MP unit on the front. Click here to buy. The Vivo NEX comes with a 6.23-inch Super AMOLED display with an aspect ratio of 19.5:9. The smartphone features an in-display fingerprint sensor and a separate AI button which is dedicated to enabling Al features only. When it comes to the processor, the device is backed by a Qualcomm Snapdragon 845 octa-core processor, which is paired with 8GB RAM and 128GB internal memory. Click here to buy. The Moto G5s Plus sports a 5.5-inch full HD display with a resolution of 1920 x 1080 pixels, which is protected by Gorilla Glass 3. The smartphone is backed by a Qualcomm Snapdragon 625 octa-core processor with 4GB RAM and 64GB internal memory. About the cameras, it has a 13MP dual sensors at the back with an 8MP unit on the front. Click here to buy. The Amazon Echo is a smart speaker that can be controlled using voice command. The speaker connects to cloud-based service Alexa which plays music, make calls, check the weather and can also book a cab and place an order on demand. Click here to buy. The Amazon Echo Dot is a mini version of Echo which can also be controlled using voice command. The Echo Dot comes with a built-in speaker and can also be connected to other external speakers via 3.5mm audio jack. It is a hands-free device, that can make calls, check the weather, play music, control smart lights and more. Click here to buy. The Amazon Fire TV Stick connects to your TV via an HDMI cable and turns your dumb TV into a smart one. The device allows you to stream movies, watch TV shows and play music from apps like Netflix, Amazon prime, Hotstar and more. It also comes with a voice remote, which lets you search for a specific movie or a show. However, one should keep in mind that the voice search feature only works with the Amazon Prime app. Click here to buy. Confusion between Home Theater and 5.1 Speakers? ?